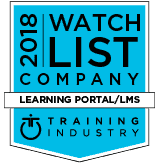 Xyleme is a leading Learning Content Management System (LCMS) and is recognized as a company to watch based on the quality of platform and administrative features provided, in addition to the level of innovation brought to the industry. In the last year, Xyleme introduced a new Learner-Portal as a part of their Content Distribution Service (CDS) product. The portal allows learners to access content anywhere. It fully integrates, out of the box, with all major LMS’s. This allows LMS users to access CDS content using their normal LMS, and get the benefits, including analytics, that CDS provides. Xyleme continues to push the envelope of analytics by releasing an ultra-scalable learning analytics engine which includes a Learning Record Store (LRS) and utilizes xAPI. Xyleme is the LCMS of choice for visionaries who understand that learning content is a business asset. These thought-leaders are looking for innovative ways to change the way learning is created & delivered. Our platform is for companies that have complex content challenges, helping them to create, publish, and deliver learning content efficiently.